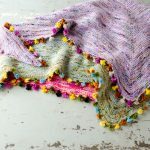 A free pattern for Tiny Tassels shawlette as well as a link to the tassel tutorial. Announce the prize giveaway of a Tiny Tassels kit and last weeks Brown Eyed Susan Shawl winner. 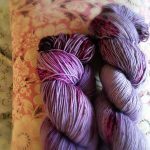 New Madelintosh colours for Spring/Summer 2018 and announcing our upcoming Pinwheel Mitten Knit-Along.